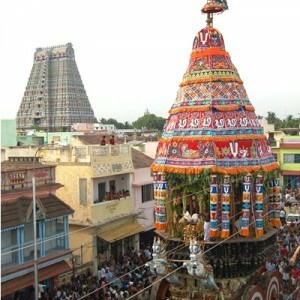 Srirangam Temple is located 0.5 Km. from Srirangam Railway Station. “Rent a Car” facility is available from Trichy Railway Station / Bus Stand / Air Port. 24 / 7 Bus Services (Route No. 1) is available from Tiruchirappalli Railways Station / Central Bus Stop / Chatiram Bus Stop. 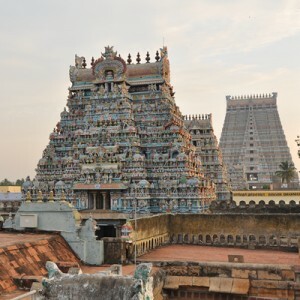 Tiruchirapalli is home to Nagaraj Cholan and many historic temples, monuments, churches and mosques. Uraiyur(also pronounced as Oraiyur) which is the Old Tiruchy has a long tradition. With over 2,500 years of known history, it was the capital of the early Cholas. The oldest man made dam Kallanai was built by Karikala Cholan across the river Kaveri about 10 miles from Uraiyur. It was an important town in the days of the later Cholas, Nayaks as well as during the early days of the British East India Company. The Madurai Nayak rulers changed their capital from Madurai to Tiruchirapalli and back several times. The conquest of Tiruchirapalli by the British East India Company marked a major step in the British conquest of India. One famous landmark in Tiruchirapalli is the Rock Fort, a huge outcrop of rock of 83 metres high, which is the only outcrop in the otherwise flat land of the city. For this reason, the city is also called Rock City. On top of the rock is the Ucchi Pillayar Koil, a temple dedicated to the Indian God Vinayaka (Ganesha), from where one can enjoy a panoramic view of Tiruchirapalli. The temple was also used as a military fort by the Nayaks for some time. On the southern face of the rock are several beautifully carved cave temples of the Pallava period. On to the eastern side is Sri Nandrudayan Vinayakar Temple, with the powerful Lord Ganesha as the main deity. A big sized Ganesha and other rare deities can be seen in this temple, which hosts festivals every year during the Vinayaka Chathurthi ( birthday of the Lord) and many carnatic musicians and stalwarts have given musical concerts over 70 years in this famous shrine. Around the rock temple is a busy commercial region, specializing in textiles, known as Chatram.